“We cannot allow our brand to be abused.” What “brand” is that? Isaac Newton Farris Jr., King’s nephew and head of the nonprofit King Center in Atlanta, said the estate is entitled to hundreds of thousands of dollars in licensing fees — maybe even millions. As the legend on the image at right says, “that change is gonna come.” Bills, checks and credit cards gonna come, too. Is that really the Promised Land? Yeah, it’s the Promised Land…we’ve just a few kinks left to work out. 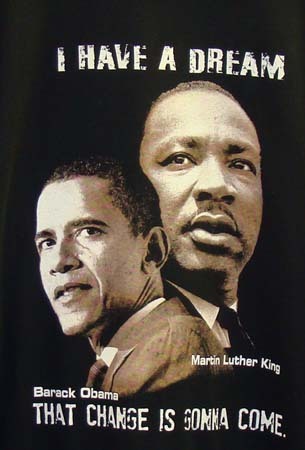 I have to wonder: in his inauguration speech, Obama quoted Dr King. D’you suppose he had to pay a royalty to do it?